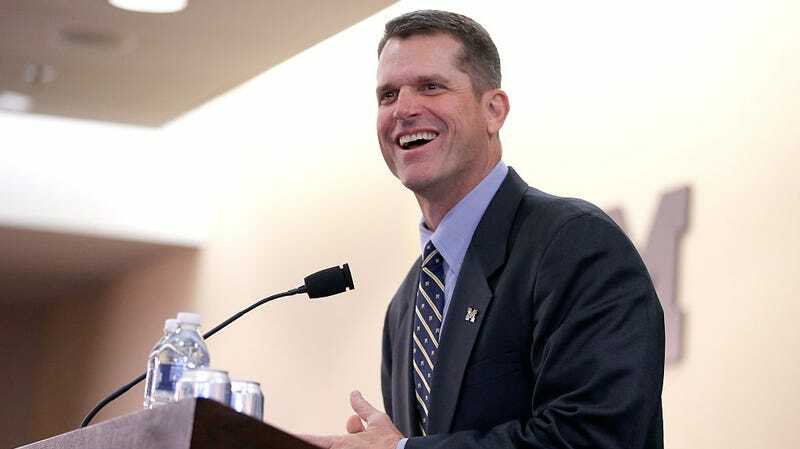 Khaki king Jim Harbaugh is fed up with low-income Americans increasingly not having access to quality legal aid, and he’s attacking the issue with his typical level of enthusiasm. In an interview with Politico (yes, you read that right), the Michigan head coach noted that, “if you have money you have access to justice,” while explaining his involvement with the government agency Legal Services Corp, which provides free legal assistance to those in need. Last month, Donald Trump revealed a plan to ask congress to nuke federal funding for the LSC, an unconscionable decision even among the many terrible, inhumane actions he’s taken as President. Harbaugh was pissed, and made his disapproval known. Harbaugh told Politico he’s worked with LSC for two years, attending meetings in Washington D.C. and Atlanta. One of the biggest issues that got me most fired up is how fines and fees are being used to punish the poor. I’ve learned how the devastating effect it can have on lives of low income Americans. I mean across the country 48 states have increased civil court fees since 2010 and they’re using those fees to pay for government services and not just courts but roads and generating millions and in some states billions of dollars. But basically the crux of it is when people can’t afford to pay a fine or a fee for things like a speeding ticket or municipal violation then they get additional fees. Late fees can start piling up and these fees can double, triple, quadruple the total amount due and if somebody has an inability to pay that fine that can quickly snowball into a driver’s license suspension or driver time. People aren’t even able to go to work. So you can’t pay a fine or a fee and then you lose your driver’s license. You’re not able to get to a job, and a lot of people, I mean, they’ve got to work. That Harbaugh has made himself a student of the subject of legal aid and the disadvantages suffered by those with low incomes is not surprising; the man is nothing if not obsessive when it comes to his interests. Harbaugh was asked a few times about his political affiliations in roundabout ways—he stated that he’s not talked to Donald Trump and that he has chatted with Barack Obama in recent months—but he made it clear that access to sufficient legal representation is something that all Americans should support. “[T]his is a bipartisan issue. This an American issue and as I said it’s about justice, and it’s essential. It’s simple fairness,” Harbaugh said.